The Guards Brigade of the Nigerian Army has flagged off Operation Python Dance (EGWU EKE) III in the Federal Capital Capital Territory (FCT), Abuja, ahead of the General Elections starting February 16, reports ITREALMS. Speaking at the Flag off ceremony, on Wednesday held at the Guards Brigade Step-up Headquarters Kuje, Abuja, the Minister of FCT, Muhammed Musa Bello said the essence of the exercise is to secure FCT and it's environs against all forms of crime and to create a conducive atmosphere for the conduct the 2019 general elections. The minister while noting that security challenges has been on the increase since the arrival of the elections, however expressed confidence in the operation python dance to guarantee a peaceful environment for the elections. "2019 general elections has arrived and our security challenges are also increasing. But I have no doubt that with what we are witnessing today elections will come and go peacefully and we will continue to operate as one nation in the objective that unite us together. "I also note that this exercise is not targeting any individual or group, but to create a condusive atmosphere for the conduct of the forth coming 2019 general elections where every law abiding citizens will exercise his or her Democratic right freely." He said. The minister therefore charged the civilian populace to accept the troops into their various communities and provide them with the needed information and any other support they need to do their job effectively. 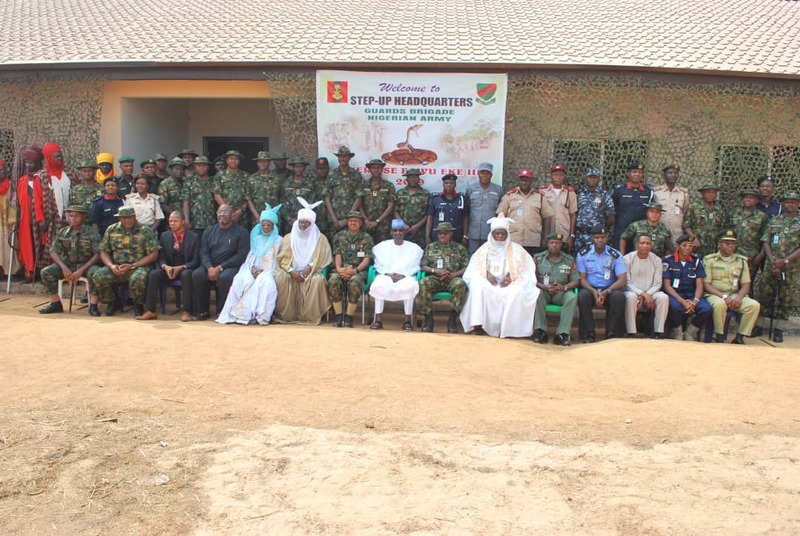 He also assured the Guards Brigade as well as all other military and paramilitary agencies within the territory of his to enable them discharge their constitutional role in the right way and manner. Earlier, The Commanding Officer, Guards Brigade, Brig. Gen. Umar Musa speaking at the ceremony informed that the exercise is in preparation against any security challenge that may arise before, during or after the 2019 General Elections. He noted that the build up to 2019 General Elections has witnessed an upsurge of security challenges such as stockpiling of arms by criminal groups, formation of militias and violence induced by political activities is on the rise. He said, "These challenges coupled with other security threats across the country such as terrorism, militancy. kidnapping and banditry portend that dissident groups and criminal elements could cash in on the situation to perpetrate large scale violence before, during or after the 2019 General Elections. Umaru assured that the exercise will rid the FCT and environs of criminal element that would likely cause havoc, while charging all law abiding citizens to go about their normal activities without any form of fear.
" I want to assure you that the officers and men of the Guards Brigade are ever ready to the responsibility of protecting the seat of government and FCT in general, and are ready to make all sacrifices needed in carrying out these tasks. "Our troops will discharge this tasks within the confines of the law and operate within the Rules of engagement and code if conflict for military operations." Umar said.